Do you decorate for winter? I honestly prefer it. Winter has a tendancy to start here in mid November and over stay it’s welcome well into spring. To brighten my home a little I try to decorate for the season sometime around Thanksgiving with items that I can leave up until Spring. This week I created simple winter art for under $5! Something that will work well on my Christmas mantle but that can stay up well after the holiday has passed. 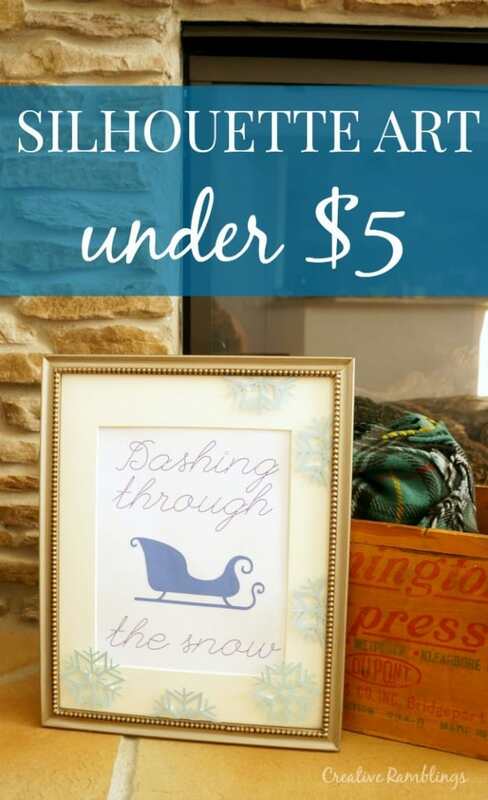 If you are intrigued by the “Under $5” part of this post be sure to scroll down and check out the other amazing projects you can do with your Silhouette for just a few dollars. I purchased my Silhouette a few years back and it was one of the best crafting decisions I have ever made. I use it weekly and love how creative I can be with my crafts. It also saves me tons of time as well as money because, in this case, I can cut my own snowflakes instead of buying them. I started with two designs from the Silhouette store. I am pretty good about checking their site once a week and downloading the free shape that is offered. Both of these designs were free at one point. I used the sleigh from one and snowflake from another. 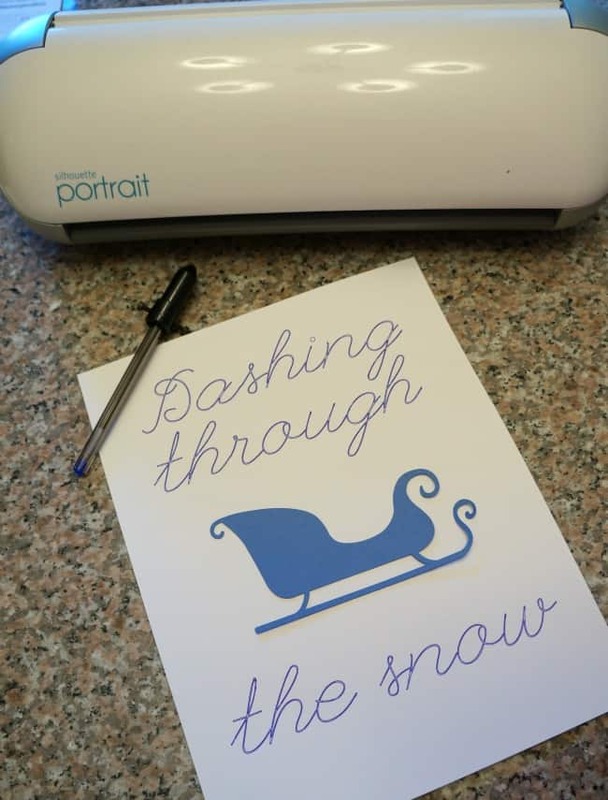 I used a blue pen and the sketch function for the words and cut the sleigh out of blue cardstock. I cut a couple snowflakes from shades of blue and added them to the mat of the frame. Such a simple project, and made from supplies you probably already have at home. Want to Check Out More Inspiring and Inexpensive Silhouette Projects? How do you decorate for winter? Love this look~very simple Christmas decor! Gotta love simple decor, thanks for stopping Rachel. So pretty and yet simple! Love it!!! Great frame upcycle. Gotta love those thrift store gems! :^) I wouldn’t have thought to place the snowflakes on the mat, but it adds such wonderful dimension. Tucking away that idea. Thanks! Thanks for such a sweet comment, and yes those thrift store finds are fantastic! 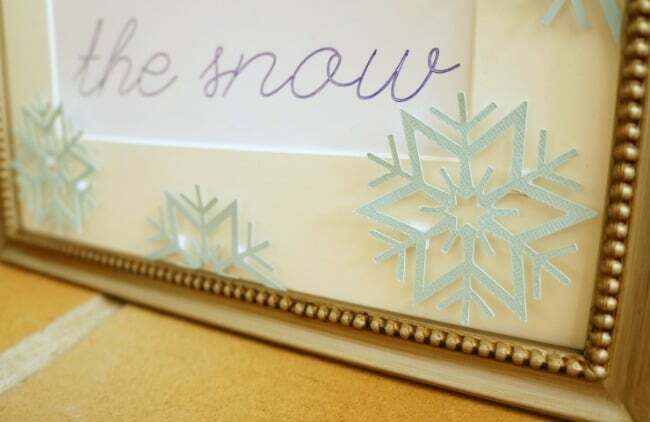 You know, I always forget about how easy it is to decorate seasonally using frames! This is lovely. Thanks for sharing the inspiration! Thanks Meredith. 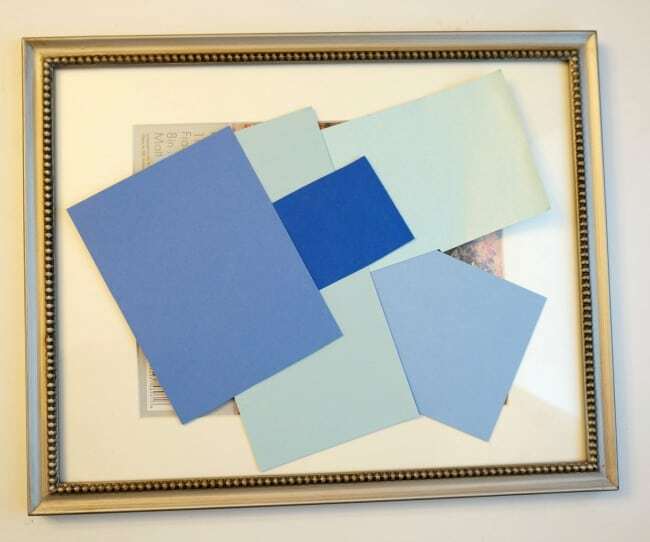 Frames are so great to have around, you never know when you might need one for a project!